A good paci clip needs to have two things: a secure clip and a good snap closure to attach the paci. When I was registering for my son I couldn't find a good one anywhere so I decided to make one. They were so easy to make that now I make them for gifts. I hope you enjoy this tutorial. Next, fold the other end of the ribbon over 1 1/4 inch and attach a full snap set on this side. Be sure to leave a little extra ribbon to hold on to while you're unsnapping the paci since this is the side that will unsnap to hold that beautiful thing! That's it! What a snap! Haha! I love it! If our little one due in April takes a paci (which Jocelyn never did), I'm definitely following these directions to make a paci clip for him or her! Sarah, you are so creative!!! I love these!!! You're site looks so great too! 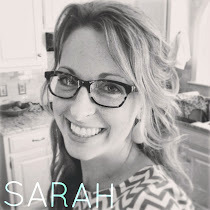 Sarah, this is great! I love your new blog. You are inspiring me to get around to some of my projects. Sam just bid farewell to his pacis yesterday, but MoonPie may need some of these. I've done burp cloths for gifts, but this takes it to a new level! I can't tell you how many of my friends are going to LOVE me for making these for them! Thank you for sharing it with us! Love it :) What a great gift idea :) Thank you for sharing! So cute and EASY! 'Don't know why I didn't think to make my own- now I have a new project for tomorrow! Thanks!! LOVE IT! i think i have one of the store bought ones and it is so overly used, it is gross to look at. you are giving me reason to be crafty. thanks! you are so creative! I've seen these around for awhile and have wanted to try making some. Thanks so much for posting the instructions--they will make great gifts!! I saw your project featured on One Pretty Thing. What a clever idea. Thank you for sharing your tutorial. I'm way past baby-making days but can certainly enjoy making these clever paci clips for gifts. So awesome! I love the ribbon you chose too! I am going to link to this on Dollar Store Crafts, too! Found via One Pretty Thing. Thanks for this cute little tutorial. A set of these would be so nice tucked into a shower gift! In the winter you can find mitten clips that have these clips on them, too. I got a set in the dollar spot at Target for $1, four little clips. Perfect for the binky keeper! I love this tutorial! I made one for a friend's shower yesterday. Thanks again for the tute! Thanks for the great tutorial! I put a picture of the one I made with a link to your blog on mine. Thanks again! I think I will give this a try today. I have all the supplies, thanks for the tutorial. These are great! I'm not in need of any, but they would make great gifts. Thanks for sharing the tutorial! Cute and useful and you can make one that perfectly fits the new mommy's style:>) Thanks for sharing!